In the fall of 2010, anti-Muslim furor in the United States reached a breaking point, capping a decade in which such sentiment had surged. Loud, angry crowds gathered near New York’s Ground Zero to protest plans to build an Islamic cultural center, while a small-time Florida minister appeared on national television almost nightly promising to celebrate the anniversary of 9/11 with the burning of Korans. At the same time, fifteen devout Muslims quietly gathered in a basement in Berkeley, California, to execute a plan that had been coming together for over a decade: to found Zaytuna College, “Where Islam Meets America.” It would be the nation’s first four-year Muslim liberal arts college, its mission to establish a thoroughly American, academically rigorous, and traditional indigenous Islam. 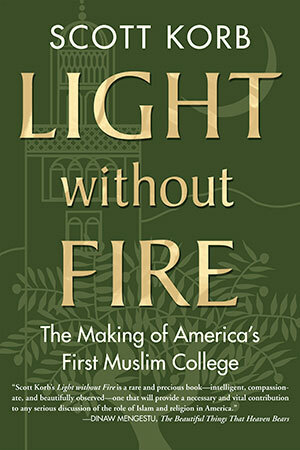 In Light without Fire, Scott Korb tells the story of the school’s founders, Sheikh Hamza Yusuf and Imam Zaid Shakir, arguably the two most influential leaders in American Islam, “rock stars” who, tellingly, are little known outside their community. Korb also introduces us to Zaytuna’s students, young American Muslims of all stripes who admire indeed, love their teachers in ways college students typically don’t and whose stories, told for the first time, signal the future of Islam in this country. From a heady theology classroom to a vibrant storefront mosque, from the run-down streets Oakland to grand ballrooms echoing with America’s most powerful Muslim voices, Korb follows Zaytuna’s students and teachers as they find their place and their voice. He ultimately creates an intimate portrait of the school and provides a new introduction to Islam as it is being lived and re-envisioned in America. It’s no exaggeration to say that here, at Zaytuna, are tomorrow’s Muslim leaders. Finding ways to explain himself is what sent a Muslim student of mine to Zaytuna Institute in the first place. Explaining themselves as traditional Muslim scholars is also what founders Sheik Hamza Yusuf, Imam Zaid Shakir, and Dr. Hatem Bazian have in mind with Zaytuna College, which, after years of planning, finally opened its doors in 2010. Because as much as nearly everyone involved in the story that follows would like to deny it, or like it not to be the case, there’s no getting around the fact that the 9/11 terrorist attacks occupy a central place in how we--all of us, Muslim and non-Muslim alike--think about Islam in contemporary America. We’d seen it once again at Fort Hood. What we’d been hearing for nearly a decade is that where Muslims gather--in the public square, a local mosque, or a military base loaded with guns--Allah is in their midst, raising Cain. When Zaytuna College opened its doors, I was there. And I was there again and again all throughout that first year--in the classroom with Rasheeda and Faatimah and Leenah, with Mahassin and Sumaya and Reem; in the mosque with Dustin listening to sermons from Imam Zaid; in Islamic centers tucked away in low-rent industrial parks with Omar and his kids; and in the dormitories and Zaytuna library with Haroon and Chris and Ahmad and Hadeel the deejay. We ate together at halal restaurants and celebrated the birth of the Prophet almost every visit. Where Muslims gather, Allah is in their midst. This much I now know is true.